We’re heading down to the coast for Sunset Beach from Playtech for a multi-board game that’s all about cocktails, volley ball and bikini-clad ladies. The first most striking thing about this slot is that it’s played over four sets of five reel, three reel boards. Each time a player spins the reels, all four are active making for a huge number of chances to win. That’s not all though, the game also uses these boards for a unique “cloned stacked wilds” feature that can really increase its overall pay outs to the player. Unique approach to gameplay. 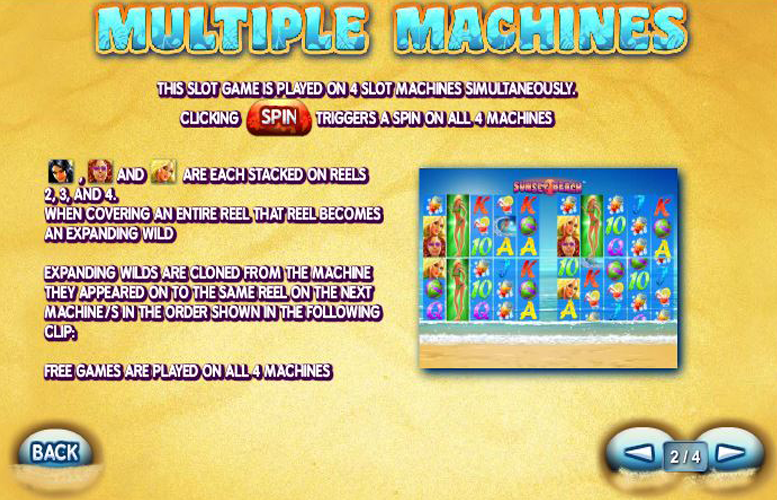 The four simultaneous boards spinning at once makes an exciting change from the standard slot machine offering. 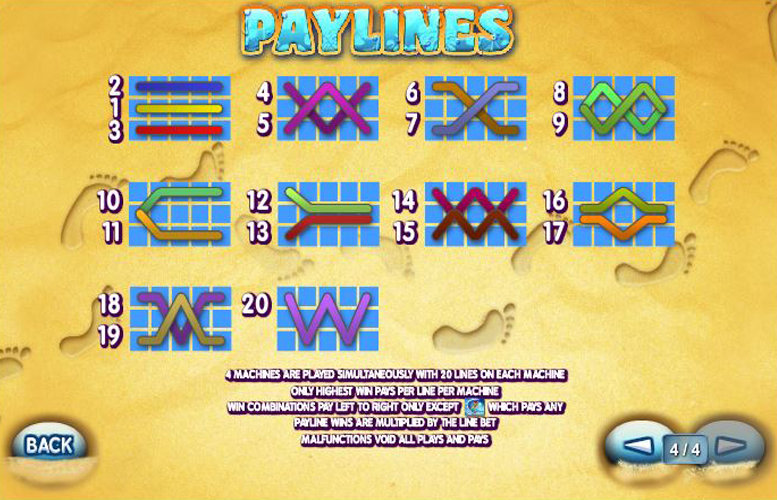 Fantastic use of features to complement the unorthodox slot design Playtech have opted for. Great for high rollers. A £2,000 per spin maximum bet is amongst the industry’s highest. Not suitable for the lowest stakes players around. With a mandatory minimum spin of 80p, those who like to bet the absolute lowest on machines might be priced out. The bikini girls cheapen an otherwise outstanding slot. Granted many users will enjoy having a bit of an ogle or at worst won’t find the unattainable beauty standards set by the gyrating girls on show too crass. However, it feels a shame that some will be put off an otherwise great game and slot experience because of them. Black haired girl = 3,000x the line bet. Brunette girl = 1,500x the line bet. Blonde girl = 1,000x the line bet. Cocktail = 400x the line bet. Drinks can = 200x the line bet. Volley ball = 150x the line bet. Being so unique, the game features of Sunset Beach are a little difficult to put down on paper. It’s better to have a few spins to fully grasp the mechanics of the “shifting stacked wilds”. There’s also a neat little video representation of it in action on the game’s information page for those who are unsure about using a machine they don’t fully understand. As noted, the Sunset Beach game is played across four slot machines simultaneously. Each click on “spin” triggers a spin on all four machines. All the girl symbols appear stacked on reels two, three, and four. When they cover an entire reel, they also become an expanding “wild” symbol exposing their bikini-clad body in full. The expanding wilds are then cloned to the next machine (takes up the same positions). If the wild girl appeared on reel two of the first machine, she would turn wild and be cloned across the second reel on all four machines. If she appeared on the third machine however, she would only be cloned across the fourth machine. Any due payment is then distributed accordingly. 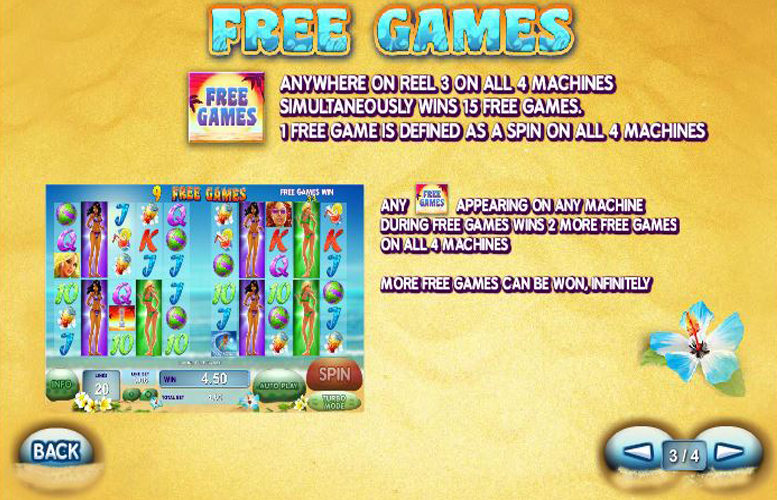 Landing the “Free Games” symbol anywhere on reel three of all four machines simultaneously will trigger fifteen free spins. All the machines are active during free games and each “free game” represents one spin on all machines. 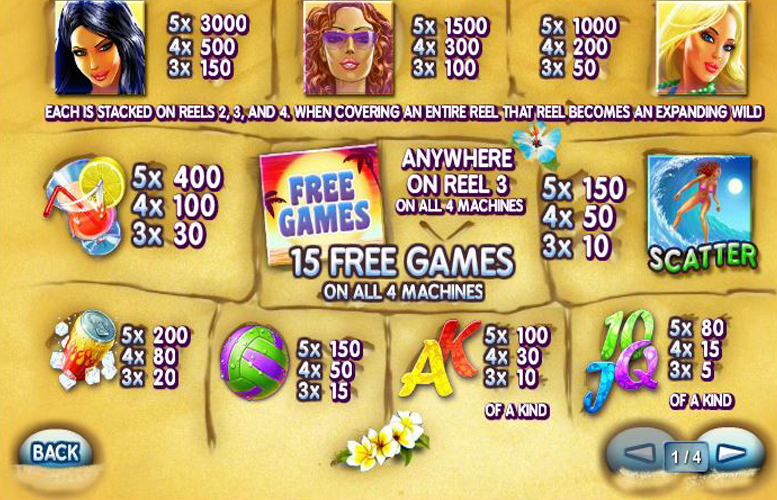 During the free spin round landing the same “Free Games” symbols on the appropriate reels on all game boards will trigger another 15 free chances to win. This can occur infinitely too. Ace or King = 100x the line bet. Queen, Jack, or Ten = 80x the line bet. Due to Sunset Beach’s innovative gameboard approach, the options to vary betting sizes aren’t as numerous as they are on other slot machines. The number of win lines is fixed at 20 and the only thing a player can adjust is how much is bet per line. The options here range from just 1p to a sizeable £25. Now, because there are four sets of 20 win lines, the minimum bet per spin is 80p, and the maximum is an impressive £2,000. This makes the machine ideal for the highest rollers out there. 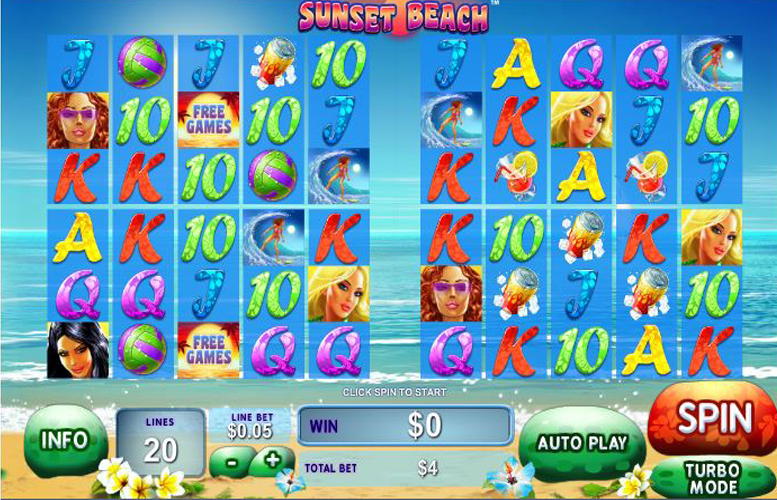 Sunset Beach is a great slot machine with which the designers at Playtech have managed to breathe new life into an often repetitive medium. The innovative approach to gameboard design they’ve come up with and a bonus feature that fully interacts with said board works excellently and will no doubt excite seasoned slot players. Unfortunately, not everyone will enjoy this game as some will be priced out by its higher than average minimum cost per spin and others might find the gyrating bikini girls a bit much. These two elements bring Sunset Beach down from a perfect score to a near perfect one. This game has a rating of 5 / 5 with 684 total reviews by the users.